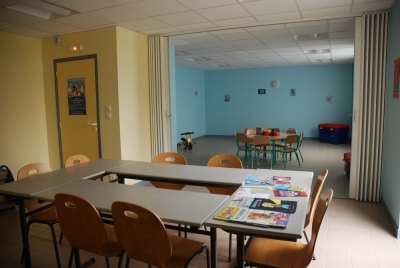 Opened 5th September 2009 in the "Espace La Chartrie" the "Relais d'assistantes maternelles" responded to the growing demand for childminders among families and a centre for childminders to be able to gain an awareness of their rights. Now, the childminders have somewhere where they can find out their rights, duties and obligations towards the young children and their parents. But it is also there to listen and exchange information between the childminders and their employers. It is also a place where free advice is given for the parents who would like to have their children placed with a childminder. It is not however a daycare centre. On the 1st October 2011, The "Communauté de communes" acquired "petite enfance". Therefore, the mangement of "Relais d'assistantes Maternelles" came under community mangement. This change in mangement will not effect the opening hours of the RAM of Descartes. However Mme BONNET, founder of RAM has decided to join the RAM of Grand Ligueillois, the CCTS has hired Melle Fleur RENAULT. The latter has the mission to ensure the continuation of this service.